U.S. President Donald Trump meets with Japanese Prime Minister Shinzo Abe during the U.N. General Assembly in New York, U.S., September 21, 2017. TOKYO - Japanese Prime Minister Shinzo Abe and U.S. President Donald Trump agreed to work together to raise pressure on North Korea, Yasutoshi Nishimura, a deputy chief cabinet secretary, said on Monday. Abe and Trump spoke by telephone after the Japanese premier’s ruling coalition scored a big win in an election on Sunday. Nishimura told reporters that Abe and Trump were planning to play golf together on Nov. 5, when Trump makes his first visit to Japan. 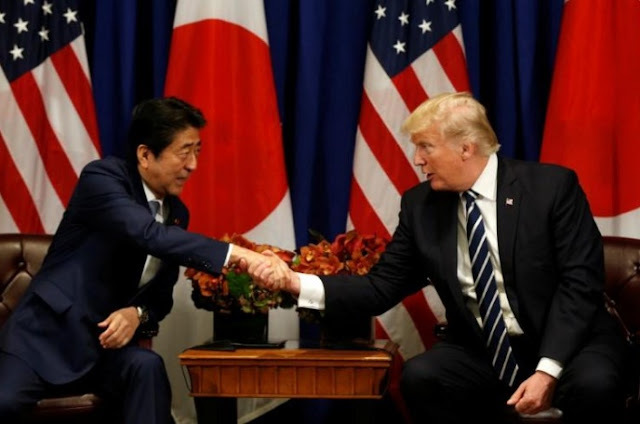 Japanese Prime Minister Shinzo Abe and U.S. President Donald Trump agreed to work together to raise pressure on North Korea, Yasutoshi Nishimura, a deputy chief cabinet secretary, said on Monday. Abe and Trump spoke by telephone after the Japanese premier’s ruling coalition scored a big win in an election on Sunday.